At 620 pages, plus the 43 pages of front matter—forward, publisher’s introduction, brief bio and critique of Burroughs, a one page list of current publications about Burroughs and acknowledgements for both this edition and the 1995 edition—the work tops out at 663 pages of impressive detail about the Master of Adventure and his over 70 titles and tales. This is very much the book that Bob (those of us who know him call him “Bob”) wanted to publish twenty-one years ago. It contains more detail about the publications of the books, is illustrated with headpieces from some of the magazine publications, drawings and inscriptions by Burroughs himself, publisher’s ads, reproductions of book illustrations, and four glossy insert sections with full-color reproductions of the pulp covers, first edition covers and dust jackets, the Grosset & Dunlap covers and jackets and the U. S. paperback covers from 1940 to 1975. 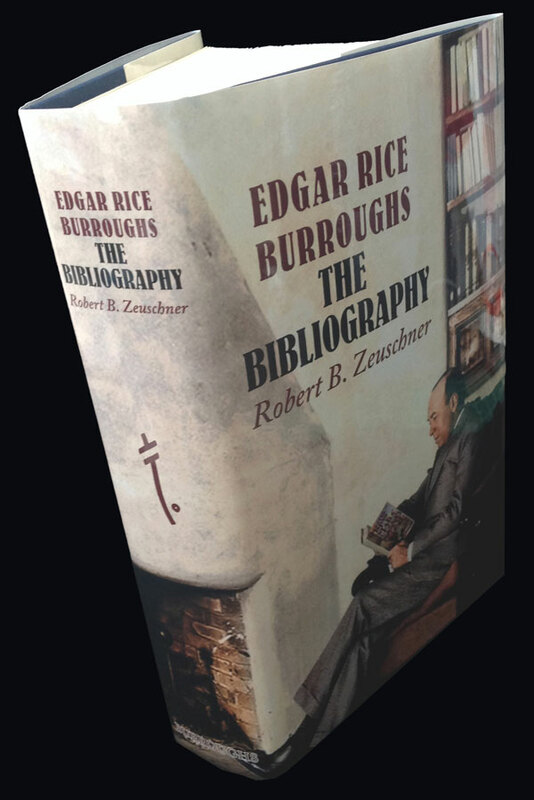 Zeuschner states plainly in his preface that the bibliography is intended as a help to anyone wishing to evaluate the contents of an ERB library, whether as collectors, auction houses, libraries or rare book dealers. There has definitely been the need for a definitive, updated guide such as this, if only because Grosset & Dunlap reprints continue to be routinely posted on eBay as first editions at exorbitant prices. The first Burroughs bibliography was published by bookseller and independent publisher Bradford M. Day in 1956 as a mimeographed list. His second, in 1962, was an offset 48-page booklet which listed not only the hardback books but the magazine and newspaper appearances along with Big Little Book titles and dates, comic books, scarce booklets, a page of Spanish language titles (not written or authorized by Burroughs) and a list of the stories which had not, at that time, appeared anywhere but in magazines. That same year Reverend Henry Hardy Heins self-published his first version of A Golden Anniversary Bibliography of Edgar Rice Burroughs, 100 mimeographed sheets including 22 pages of photo-offset illustrations. The print run was limited to 148 copies but it was enthusiastically received and plans were soon made with publisher Donald M. Grant to put out a more complete edition bound in hard covers. That new edition, in 1964, included so much in the way of ephemera, illustrations, publishers listings and detail about distinguishing points in first editions and reprints that it became the standard for Burroughs bibliographies for years to come. At the beginning of the “Burroughs Boom” of the 1960s, Heins’ massive work stimulated the search by collectors for even more of what had been lost or hidden away in newspapers and magazines throughout Burroughs’ career. Canaveral Press’ new hardcover first editions, Ace Books and Ballantine Books reprints of the hard-to-find novels in paperback, and renewed interest in SF & Fantasy fandom through fanzines like ERB-dom, ERBANIA and others, was introducing a whole new generation of readers to the worlds of Edgar Rice Burroughs. And they wanted to find out as much as they could. Zeuschner’s 1995 bibliography was definitely needed when it came along. There was so much more to cover in the thirty-one years since Heins. However, Bob was not happy with changes made by his publisher, McFarland, and he was itching to correct and update practically everything in the book. The range of books, articles and ephemera relating to ERB’s creations numbering in the tens of thousands, Zeuschner has wisely chosen to make this a bibliography primarily of Burroughs’ fiction published in English. 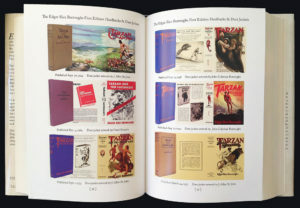 A few oddities have been included however, which might have been better handled in the appendices, such as the privately printed collection of dust-jacket scans produced by the late Bruce Wood; a pop-up book directly related to the movies “The New Adventures of Tarzan” and “Tarzan and the Green Goddess,” which Burroughs produced; and The Illustrated Tarzan Book, No. 1 which reprinted the 1929 Hal Foster sequential art, with text by R. W. Palmer. These items are certainly collectible, but it’s doubtful that ERB himself wrote anything on them. 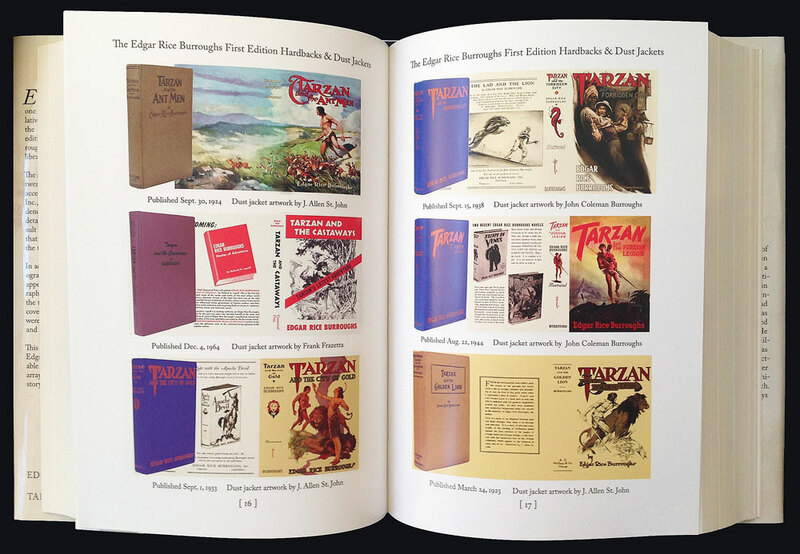 It’s likely that he wrote some of the text on the ERB, Inc. dust-jackets, but only 15% of the prose in Tarzan of the Apes was allowed to be used on the Foster serialization per contract. Writing a bibliography is not a simple feat. You can start by making a list of the titles you know exist, but that’s just the most basic of foundations. You have to know the printing histories of the titles: were they reprinted and if so did the original publisher do them, or were the reprint rights sold to someone else? Much of that information is stock-in-trade for the Burroughs collector. Heins’ bibliography is still relevant for the first editions and the reprints up to the 1960s. The revised second edition of 2001 included a “Postscript and Errata” which corrected descriptions of the first edition of Tarzan of the Apes, The Girl from Hollywood and a few others. In the fifty-two years since 1964 there’s been a huge number of reprints and reference books published along with more attention paid to the “points” or distinguishing elements in the numerous G&D reprints—how many ad pages in each printing—as well as attempts to identify priorities of first edition printings by broken type, plate wear, etc. As the books have gone into public domain, an enormous number of inexpensive paperbacks and print-on-demand hardcovers have also become available. Woe betide the bookseller who cannot keep them straight! All this besides the secondary market of collectibles comprised of art portfolios, fanzines, critical works, articles about the Burroughs family, illustrators, comic art, and more. Zeuschner concentrates on the primary works, of course, with plentiful information for each entry. He makes sure that all iterations of the books are described as fully as possible. This is what booksellers and auction houses need in order to decide value between first editions and reprints. Collectors and libraries will find the descriptions helpful as they try to determine which editions are worthy of acquisition. There are numerous entries for the paperback reprints from both Ace Books and Ballantine Books with cover artist noted as well as ISBN numbers and stock numbers. Information about the output of speciality presses like Easton and University of Nebraska and independent publishers like Wildside, Quiet Vision and ERBville/Pulpville is also included. Among the notes for each title are hidden such wonderful extras as the text of the omitted foreword to Back to the Stone Age which only appeared in the magazine version; missing lines from the first edition of Beyond Thirty; the G&D remainder-bound edition of The Cave Girl with a tipped in title page; the number of remaindered ERB, Inc. first editions which were sold to G&D and only furnished with a new dust-jacket; the first book to use a running head with ERB’s name on the recto; the convoluted history of Tarzan and the Forbidden City and more. As is appropriate, the entry for Tarzan of the Apes is the longest and most detailed, 36 pages. This is what can make a bibliography fascinating reading for the collector. Finally, the book contains no less than fourteen appendices to cover all the details that could not have been easily discussed in the main listings. They range from a much simpler accounting of the points needed to distinguish the first editions and first states; a short essay on valuation; a disambiguation of Jerry Schneider’s ERBville/Pulpville/Pulp Tales/Golden Lion/ERB Press/etc. publishing empire, written by the publisher himself; a bibliography of audiobooks; print runs of all the ERB books from A.C. McClurg & Co. and ERB, Inc.; a list of which companies published ERB first editions; the order in which each novel (and some articles) were written and published; a short article on ERB-related Big Little Books and a list of publications from House of Greystoke—the publishing wing of The Burroughs Bibliophiles; a complete list of the 1948 ERB, Inc reprints; and two comprehensive bibliographies of ERB-related reference books and secondary sources. The book ends with a selective index, primarily of proper names of artists, contributors, general reference items and subjects of interest. No one person can collate all this information without the help of as many collectors and fans as he can connect with. * Heinz listed practically every big-name collector of his day in his 1964 and 2001 acknowledgements, and Zeuschner does the same. Many of the names will be readily recognizable to any fan who haunts the ERB groups on Facebook. Even with an army of very knowledgeable people there are bound to be a few mistakes and odd occurrences in a tome of this size. I have never worked on a publication of any size where there has not been at least one typo. This is usually not a major problem, however in a work like this it is inevitable that an errata will be issued in the future. Though most collectors know and can forgive misattributions when they are obvious, it is important to correct such accidents as naming Fred Arting, instead of Clinton Pettee, as the artist of the October 1912 The All-Story magazine cover on page xv. One final comment has to be made about the color sections included in the book. These four sections consist of 352 colorful covers of pulps, first editions, reprints and U.S. paperback covers. This is a wonderful addition to a bibliography where the associated art for each title is very much part of the attraction to the whole Burroughs collecting experience. No other Burroughs bibliography has had this much cover art, and never in full color. The pulp and paperback sections, amounting to sixteen pages each, are beautifully bright. Though the cover images are small, 1.75″ x 2.5″ for the pulps and 1.375″ x 2.375″ for the paperbacks, they give a good idea of the image, the scans have been nicely cleaned, and they are arranged with publication date and artist noted. The Grosset & Dunlap section is inserted as a double gatefold. All these images are also ordered by date of publication with a title key on the first page. The two flap panels show the book’s spines, both jacketed and unjacketed, in order of publication. The four facing panels (inside the gate) show the jacket fronts with the unjacketed boards peeking out from between each jacket. These covers were obviously photographed from an actual collection as they show highlights and shadowing along the spine edges and some light flash on a few covers. Although not as bright as the pulps and paperbacks, it is a treat to see a collection lined up as it is on the flap panels. Two of the books also include their promotional belly bands. The back panel of the gate shows a three-color ad poster for G&D circa 1933. It is unfortunate that the center of the gatefold is glued so deeply into the book that four of the covers are obscured. Other than this one unfortunate glitch, this massive bibliography has everything that someone involved with Edgar Rice Burroughs books and collections will need to quickly check for authentication of first editions, reprints and other related publications. Whether a bookseller, a collector, an auction house, someone interested in the pulp fiction market or the secondary fantasy and adventure art market, this will remain the authority for years to come. We are unlikely to see a reprinting any time in the future. The production values of printing and binding are absolutely first rate. Bob Zeuschner’s life’s work in Burroughs collecting has come to fruition with an indispensable reference work that adds interest and knowledge to a field already packed with studies, articles and tidbits for the dedicated. *Full disclosure: I, too, did my small part to help Bob move this book forward by spot proofreading through parts of eight different iterations, offering suggestions for final format and helping to clarify certain publishing and printing terms. I also created two different dust-jacket designs which were not used. I was asked to help with the color sections, but the request came close to the publishing deadline when other work commitments would not allow me the time I knew was needed to do it well. Though I have registered my criticism of one of the color sections, I also know what a difficult job it must have been. Previous Previous post: The Mayan Princess Unbound! Next Next post: Getting through the Land of Terror!